Back in May, when ANZ Banking Group (ASX:ANZ) cut its dividend and flagged a lower dividend payout ratio, it was a strong signal that bank investors should not count on an unending stream of rising dividends. As dividend payments – and, more precisely, the dividend payout ratio – is a topic close to most retail investors’ hearts I thought it would be timely to take a closer look at what the future holds. There has been a lot written about whether the major banks have the ability to maintain their high dividend payout ratios in the face of the increase in regulatory capital requirements. In the article below, I address this question. In the wake of the GFC and the burden that was placed on taxpayers to recapitalise and/or reduce the perception of risk associated with banks around the world, bank regulators have significantly increased the amount of equity capital they are required to hold against their lending and other assets. This has also impacted the major Australian banks. Increased equity capital requirements reduce the amount of leverage in a bank’s balance sheet. As a result of holding more equity for a given value of assets, the return on equity generated by the major banks has been diluted. Over the last 10 years, the ROEs for the major banks have fallen from just over 20% to just under 15%, as shown in the chart below. This coincides with an increase in the average common equity tier 1 capital ratio for the major banks. 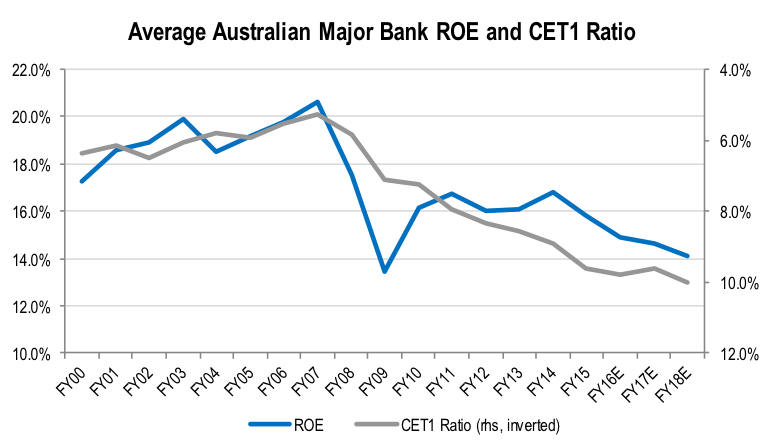 The chart below also shows that the majority of the increase in ROE between 2000 and 2007 resulted from falling CET1 ratios. The other way to look at this is increased gearing of bank balance sheets was the primary driver of rising ROEs in the early part of the last decade. With further refinement of bank regulations over the next few years under Basel IV and APRA’s as yet undefined “unquestionably strong” requirements, capital backing is likely to increase further, putting additional downward pressure on major bank ROEs over the next few years. The rate of return regenerated on incremental capital invested in a business is a major determinant of its sustainable dividend payout ratio. The marginal return on equity determines the amount of capital that needs to be invested to generate future earnings growth. The other driver is the rate of earnings growth in future periods. The higher the earnings growth, the lower the dividend payout ratio needs to be. Given the high market shares held by the major banks, the rate of earnings growth is largely constrained by the rate of growth in the overall market. As we discussed in the post on 21 September, loan book growth over the last 20 years has been stimulated by falling interest rates, resulting in an improving affordability of debt. This has allowed loan books to grow at a faster rate than nominal GDP, implying increased levels of gearing in the broader economy. With further reductions in lending rates constrained by funding costs that are nearing 0% and ongoing low inflation, lending growth is likely to be considerably slower going forward. For a given level of earnings growth, the reduction in ROE would naturally imply that the sustainable dividend payout ratio would need to fall for the major banks. This would likely result in a reduction in the absolute level of dividends paid per share by the banks. However, the outlook for slower earnings growth provides an offsetting reduction in the amount of earnings that needs to be retained. Consequently, it is not clear in this context that dividend payout ratios need to fall going forward. In the context of a reduction in ROE from 20% to 15%, an offsetting reduction in future earnings growth from to 6% to 4.5% a year would enable the bank to maintain a 70% payout ratio. The irony is that while the ability to maintain a high dividend payout ratio would probably be treated favourably by the market, we view this as a material negative for valuation. The benefit of compounding growth means shareholders are far better off in the longer term if the bank is able to reinvest a larger amount of capital at a 15% ROE to drive earnings growth, than if they reinvest less, deliver less growth but pay a higher dividend today. Hear this argument a lot & I don't know how investment commentators can conclude that shareholders are automatically better off by banks cutting dividends & reinvest in business. More depends on what they reinvest in & historically, banks & other businesses have made some pretty ordinary investment decisions. Further, I doubt that any extra expenditure would make much difference to bank growth in current economic climate. As a bank shareholder I would rather have the current dividend level & re invest myself. Hi Tony, I had a similar thought process to you and I think it is a good point of discussion. I agree Tony, I can't see where the banks are going to invest retained capital and generate a ROE of 15% or greater - there's going to have to be some pretty extraordinary Fintech start-ups out there if that is to be achieved, lol. The history of Australian corporates investing overseas is littered with destruction of shareholder value, so that's not a good idea. The only other related areas I can think if are insurance and funds management, and we all know how that's turning out....... Look, lets face it - the natural state for banks is in the utility space, we were all a lot better off when that was the case. The relentless drive for growth over the last 30 years or so has overall, left society poorer. The sooner banks realise this the better we'll all be, so keeping payout ratios at the high end is what they should do - don't give them ideas of reinvesting capital they're not capable of allocating profitably! I would be interested to hear if Stuart has any specific ideas concerning where the banks could reinvest capital at 15% ROE or greater? Montgomery should acknowledge that they actually hold shares in the banks (at least CBA and Westpac), so this article is slightly misleading. Unless the fund manager holds shares in companies they have a negative view of - which would seem silly. In fact, Livewire should require writers to add a disclaimer about whether or not they hold any of the stocks they mention.